The 2019 MINI Cooper S Countryman is a stylish and spacious subcompact SUV that’s ready for your adventures around Annapolis, Highland Beach, and Hillsmere Shores. Before you can decide if you’re ready for this vehicle, you’ll need to learn more about it. Luckily, our team at MINI of Annapolis created this detailed review of the 2019 MINI Cooper S Countryman. Discover what this automobile has to offer, and feel free to contact us if you have any questions. With comfortable and spacious seats, five people are sure to feel relaxed inside the 2019 Countryman. Up front, you get 39.9 inches of headroom and 40.4 inches of legroom. In the back, there are 37.5 inches of headroom and 37.6 inches of legroom. Whether you’re riding solo or with a full house, you’ll want room to carry grocery bags, luggage, or other items. In this vehicle, you’ll get 17.6 cubic feet of cargo room behind the rear seats. Fold that row down and the space expands to 47.6 cubic feet. Plus, roof rails come standard. That way, you can transport bikes or other large items to your next excursion. If you want an impromptu picnic after a long bike ride, take advantage of the available Picnic Cushion. This plush seat easily folds down, letting you get comfy while you take in the view of wherever you are. You can also enjoy the many high-tech features found inside the MINI Cooper S Countryman. For instance, you’ll find Apple CarPlay™ smartphone integration in the highest trim level. This app allows you to make phone calls, send text messages, access podcasts, and perform other functions without touching your phone while driving. If you need directions to a new hot spot in the area, simply enter the address into the available touchscreen navigation system. Plus, it comes with real-time traffic updates, so you’ll get from Point A to Point B in no time at all. 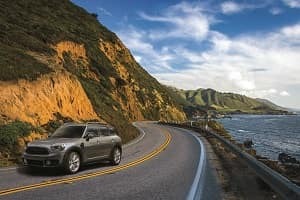 Still, the technologies inside this SUV will do more than keep you connected and entertained. They’ll help keep you safe, as well. One feature that you’ll appreciate is the available Active Driving Assistant, which includes driver-assisting technologies, such as Forward Collision Warning and Automatic Emergency Braking. If a collision is likely, the system will send warnings for you to take action. If you don’t react in time, it can automatically apply the brakes for you. The 2019 Cooper S Countryman has a well-rounded performance with engaging handling and a peppy engine. It comes with a 2.0L TwinPower Turbo 4-cylinder engine that delivers 189 horsepower and 207 lb-ft of torque. Plus, the engine is paired with an 8-speed automatic transmission that has seamless shifting. Not only is the vehicle quite powerful, but it’s very fuel-efficient, too. It achieves an EPA-estimated 27 combined MPG, so you can spend more time cruising around town and less time searching for a nearby gas station to refuel. Additionally, the Cooper S Countryman comes standard with various driving modes to customize your driving experience. Whether you want to focus on performance, efficiency, or a mix of both, you can with the Sport, Green, or Mid settings. 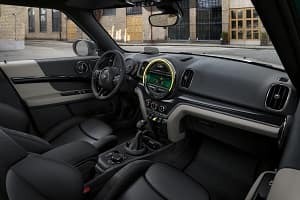 Between the interior space, technologies, and performance, the 2019 MINI Cooper S Countryman has a lot to offer drivers throughout Annapolis, Highland Beach, and Hillsmere Shores. If you’re still on the fence, then you’ll want to get behind the wheel. 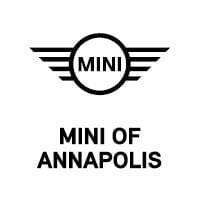 Experience this subcompact SUV for yourself by scheduling a test drive at MINI of Annapolis today!